Our trained contractors offer a total basement remodeling package for Delaware homeowners wanting a brand new usable space in their home. Our total basement remodeling package includes wall, floor, ceiling, and window systems custom-designed just for you. We guarantee that our finished basement system will resist mold, moisture, and mildew for over 50 years. We understand that not all Delaware homeowners need or want a completely remodeled basement. 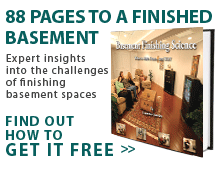 If you're looking to complete a smaller basement finishing project, that's fine! We can help with one or all of the basement systems (i.e. ceiling, walls, floor, windows, etc.) listed above. If basement remodeling or basement finishing has been on your To-Do list for far too long, contact one of our Delaware basement finishing contractors today! We have years of experience in planning, designing, and completing remodeling and refinishing work on basements throughout the Diamond State. Finally, you can turn your Delaware home's neglected basement into the usable diamond in the rough that you and your family will enjoy for decades to come! Our network of Delaware basement finishing contractors covers such cities as Wilmington, Dover, Delaware City, Harrington, and New Castle. Call today to schedule your free basement inspection and to receive a basement remodeling quote! Looking to finish a 600 Square foot basement. Comment: Looking to finish a 600 Square foot basement.